Come and meet Bernard R. Bunny! The R stands for Rabbit – but if you are nice, he will let you call him Berny. We thought our Easter egg trinket box needed something a little special inside, and so we could think of nothing better than to find little Berny inside of our Easter egg. Rabbits are not just for Easter though, Berny likes to hang out in lots of places and could be made for lots of different occasions. In this pattern we give full detailed photographic and graphic instructions, and there are 64 detailed steps, making this pattern even suitable for beginners to beading. This bead pattern is made using Japanese Miyuki size 11 Delica. Round Peyote stitch is used but full detailed instructions are given, and no previous knowledge of the stitch is required. Please note the pattern may not work with any other size and type of beads. There are 6 delica colours in total and the finished beadwork is approximately 4.5cm (h) x 1.8cm(w) 1 x 3mm Fuchsia Fire polished bead is also required along with polyester wadding. 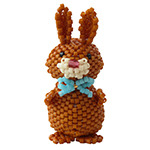 The bead pattern supplied is 22 pages and includes step by step photo and graphic instructions.